Please provide a list of services and items for sale at your Collinsville business for a database being generated by the Chamber of Commerce. Give your list to Wanda at the Chamber Office (11th & Main) or email to cvillechamber3477@sbcglobal.net. This is for all Collinsville businesses, not just Chamber members. Rick Brinkley (now of the Tulsa Better Business Bureau) pointed out to the Chamber of Commerce that for many years he told his Collinsville Community Church congregation to be trusting, but now spends most of his time telling people to not be so trusting. Brinkley gave many examples of people in this area freely giving scam artists their personal and financial information with the end result of also loosing a lot of their money. Brinkley said the types of scams are numerous and ever changing but the most successful still seems to be unsolicited "winners" of foreign lotteries or any excuse to send a large check where a "small" portion is to be returned (to the scammer) before the check is determined to be worthless. Another large problem is business identity theft with logo's lifted from web sites being used to print fake checks on home computers. "Spoof" cards have made called-ID unreliable as scammers can make it appear they are calling from a well known ligit business and the devices can also alter the voice of the caller. Rick recommended checking your credit rating periodically and even the credit rating for young children as they are also frequent targets of fraud from those with access to social security numbers. 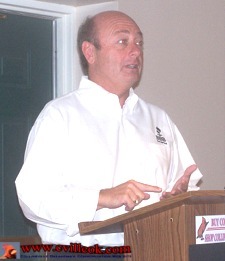 Roy Weather's All-Weathers Electric sponsored the August luncheon.